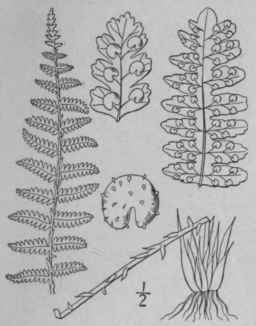 Polypodium noveboracense L. Sp. PI. 1091. 1753. Aspidium noveboracense Sw. Schrad. Journ. Bot. 18002: 38. 1801. Dryopteris noveboracensis A. Gray, Man. 632. 1848. Rootstock slender, widely creeping. Stipes slender, short; blades lanceolate, tapering both ways from the middle, 1°-2° long, 4'-7' wide, membranous, once pinnate, the apex long-acuminate; pinnae 1 1/2'-3 1/2' long, lanceolate, sessile, long-acuminate, deeply pinnatifid, pilose along the midribs and veins, especially beneath, ciliate, the lower (2-7) pairs gradually shorter and deflexed, commonly distant, the lowest auriculiform; segments flat, oblong, obtuse, the basal ones often enlarged; veins simple or those of the basal lobes forked; sori near the margin; indusia small, delicate, glandular, withering. In moist woods and thickets, Newfoundland to Ontario and Minnesota, south to Georgia, Alabama and Arkansas. Ascends to 5000 ft. in Virginia. Sometimes sweet-scented in drying. July-Sept.
Acrostichum Thelypteris L. Sp. PI. 1071. 1753. Aspidium Thelypteris Sw. Schrad. Journ. Bot. 18002: 40. 1801. 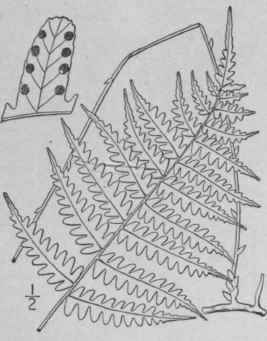 Dryopteris Thelypteris A. Gray, Man. 630. 1848. Rootstock slender, creeping, blackish. 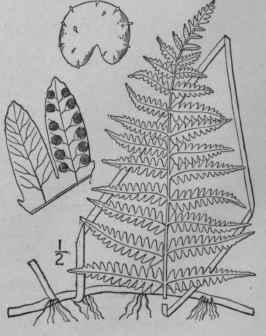 Leaves long-stipitate, the blades lanceolate or oblong-lanceolate, scarcely narrowed at base, 1°-2 1/2° long, 4'-6' wide, short-acuminate, membranous, once pinnate; pinnae 1 1/2'-3' long, linear-lanceolate, short-stalked or sessile, horizontal or decurved, broadest at the base, short-acuminate, pubescent or pilose beneath, deeply pinnatifid; segments oblong, obtuse or appearing acute from the strongly revolute margins; veins regularly once or twice forked; sori nearly medial, crowded; indusia small, glabrous. In marshes and wet woods, rarely in dry soil, New Brunswick to Manitoba, south to Florida, Louisiana and Texas. Ascends to 2000 ft. in Vermont. Europe and Asia. Summer. Wood-, Swamp-, Quill- or Marsh-Fern. Aspidium simulatum Davenp. Bot. Gaz. 19: 495. 1894. Dryopteris simulata Davenp. Bot. Gaz. 19: 497. 1894. As synonym. Rootstock wide-creeping, slender, brownish; stipes 6'-2o' long, straw-colored, dark brown at base, with deciduous scales; blades 8'-2o' long, 2'-7' wide, oblong-lanceolate, membranous, once pinnate, little or not at all narrowed at the base, the apex abruptly acuminate, attenuate; pinnae 12-20 pairs, lanceolate, deeply pinnatifid, the segments oblique, oblong, obtuse, entire or lightly crenate, slightly revolute in the fertile leaf, ciliate, finely pubescent along the midribs; veins simple; sori rather large, somewhat apart, mostly nearer the margin than the midrib; indusia finely glandular, withering, persistent. In woodland swamps, Maine to Maryland. Reported also from Missouri. Late summer.